Ringworm is a bothersome condition that can be passed to humans from guinea pigs. The skin disease needs to be identified and treated immediately to keep your family safe, but understanding how the infection is transmitted can help prevent it in the first place, removing that extra bit of worry. It's important to understand what to look for when determining if your guinea pig has ringworm so you and your family can avoid picking up the infection. Ringworm usually begins on the head as bald patches. The bald spots will have red patches that appear flaky and crusty. On the face, the guinea pig will experience bald spots around the ears, nose and eyes. Handling an infected guinea pig without properly washing your hands afterward can spread the infection. 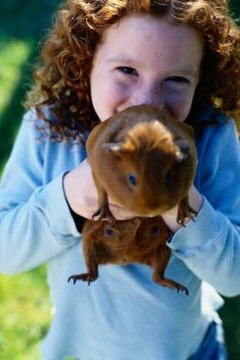 Another mistake that can spread the infection is holding the guinea pig close to your face or kissing your guinea pig. When your guinea pig has ringworm, even the bedding and other objects in the cage can carry the infection. Always use gloves when cleaning your guinea pig's cage. The most important thing you can do to prevent ringworm infection in your guinea pig is to clean his cage regularly. Ringworm thrives in moist, warm environments. Remove soiled bedding and old food daily to prevent moisture from building up. Do a thorough cage cleaning weekly, sanitizing all surfaces with an equal mixture of vinegar and water. Should your guinea pig get ringworm, and you have more than one guinea pig, separate him immediately to prevent the spread of infection to other pets. Depending on the severity of the infection, a veterinarian may prescribe oral or topical anti-fungal medication. Guinea pigs with a severe infection will need five to six weeks worth of oral medication, while guinea pigs with only a few patches will usually be treated with seven to ten days worth of topical medication. Vitamin supplements may also be suggested to help improve your guinea pig's health. Do Bearded Dragons Secrete Salmonella?